You've seen me wear my heart on my sleeve, but today I'm wearing it around my neck. A few months ago, I fell in love with this embroidered heart locket that I spotted on Katie Shelton's blog as one of her Etsy Loves. The embroidery is simple yet so beautiful, and I was just dying to make it mine. Unfortunately, the Etsy listing for the locket has since sold out, so since I couldn't buy, I decided to DIY! I love lockets because they combine two things that are important to me when it comes to jewelry: simplicity and personality. I wear very little jewelry on a daily basis, but what I do wear is simple and is a symbol of what I love in life (like my Nick ring.) Lockets are the best of both worlds because they look simple from the outside, but inside they're hugely personal, as they often hold a photo of someone special to you. With the holiday season fast approaching, a locket would make an excellent gift for a friend or family member. Not to mention, this gift is super inexpensive (depending on your locket) and you can complete it in less than an hour! Want to give it a try? My locket was thrifted and I LOVE the vintage look and the patina of the metal. If you don't have an old (or new) locket and can't find one in a local thrift store, remember you can thrift shop online! ShopGoodwill.com has a lot of lockets and they add new items all the time! I love the idea of using an old locket rather than buying a new one, but any locket will do! - First, clean your locket. Once there is a photo and embroidery inside, it won't be as easy to do, so clean it while you have the chance! - If printing a photo, measure the inside if your locket where the photo will be in order to determine the appropriate size. Use your photo editing software or Microsoft Word to crop and resize the photo. Print on paper of your choice. - Use scrap paper and pencil to trace the inside of your locket where the embroidery will go. Cut out to use as your template. If both sides of your locket are the same size, you can use this template for both the embroidery and the photo. - Lightly trace around your template onto your fabric and draw a heart in the center. Place your fabric in your embroidery hoop. Following your heart outline, use the needle and embroidery floss to embroider the heart on your fabric. I started on the left side and embroidered from top to bottom, moving from left to right. Once finished, tightly knot your floss in the back and remove fabric from embroidery hoop. - Cut out your embroidered heart along the light pencil line you traced from your template. 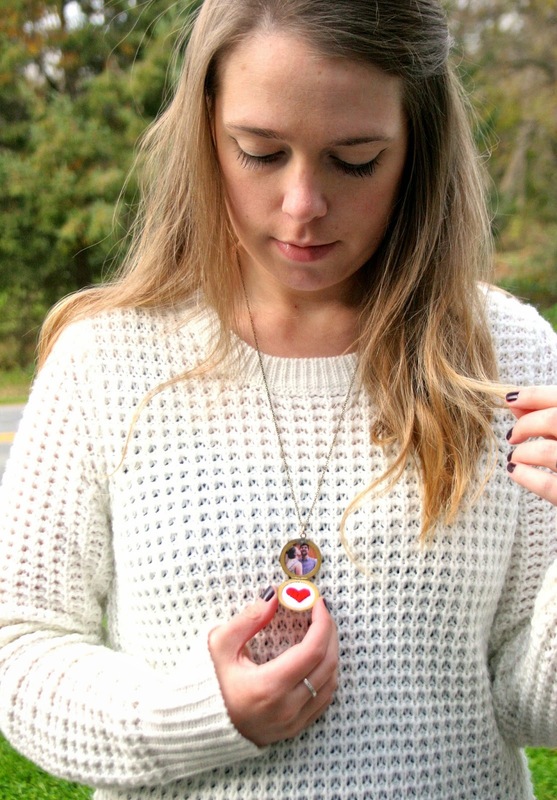 Using a paintbrush, apply Mod Podge to the inside of the locket and attach your embroidered heart. Press firmly and apply a small amount of Mod Podge around the edges to secure. 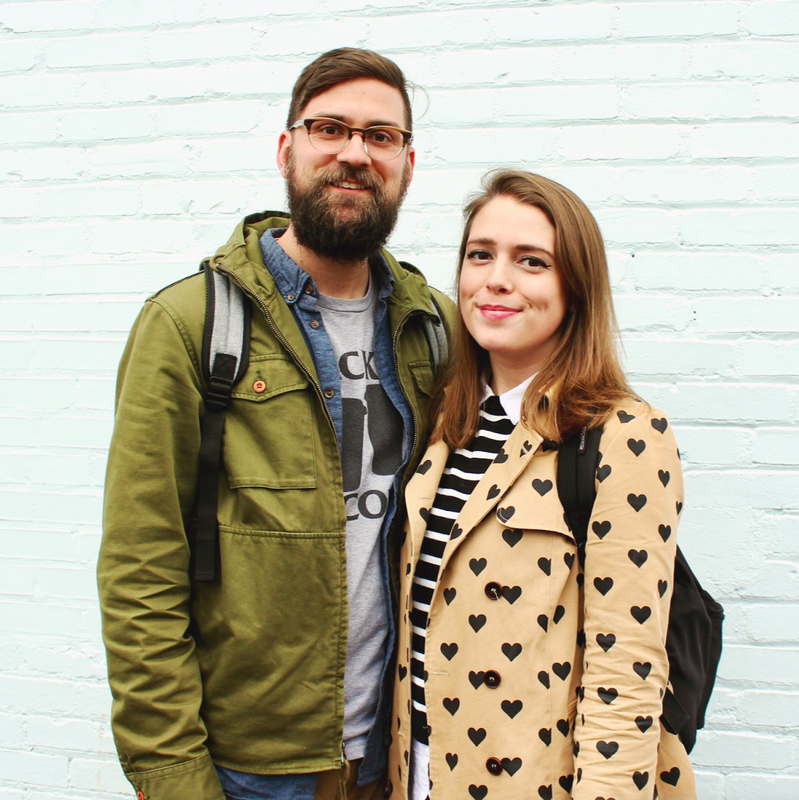 - Next, lightly trace around your template onto your photo. 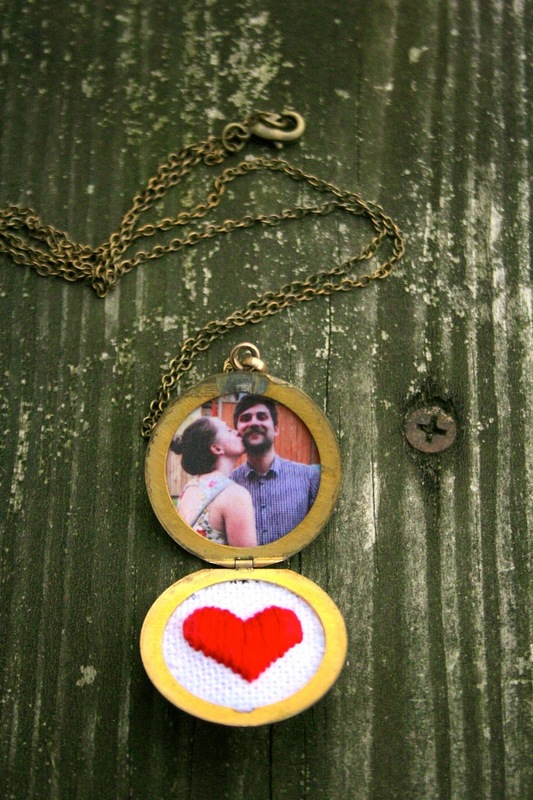 Cut out the photo with scissors and attach to the opposite side of your locket with Mod Podge. Seal the top of the photo with another coat of Mod Podge to help protect it. - After the Mod Podge has dried, your locket is ready to wear! I. Love. This. Locket. It was so easy to make, but packs a huge personal punch. If you're looking for a handmade gift idea for the holidays, definitely keep this one in mind. Concerned about the embroidery? Don't be. Until this project I've never embroidered anything in my life. Easy peasy! Fun Fact: My first ever locket came with my VHS tape of The Secret Garden. Anyone else? That's so cute! I never would have thought to do that. haha, thank you so much! I never did embroidery before - I just made it up and it worked out okay :) Give it a try! Thanks so much! It's from Rue 21!